The semi-annual testimony of Federal Reserve Chair Janet Yellen on monetary policy before Congress was roughly in line with expectations. Yellen was cautious not to create expectations that the Fed was preparing to hike interest rates imminently but at the same time she wanted to signal that the Fed was still moving towards some sort of policy normalization. This was a balancing act that Yellen appeared to be managing relatively well. The Fed is also still trying to transition from forward guidance – type of rules to full flexibility with the use of language such as “patience” in raising interest rates. One problem that the Fed Chair pointed out was that inflation was currently too low for higher interest rates. 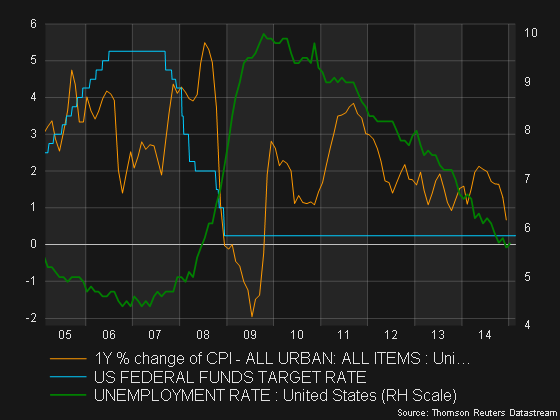 The risk was that if the Fed raises interest rates, it could push inflation even lower and away from its 2% target. Of course inflation – currently at 0.8% – is heavily influenced by the drop in fuel prices and the medium-term outlook for inflation is more positive than current readings suggest. The inflation outlook could improve if wages start to increase further as unemployment continues to fall. Another important takeaway from Yellen’s testimony was that there was no pre-set schedule of interest rate increases. This might have been comforting to those fearing an interest rate hike ‘campaign’ by the Federal Reserve. The Fed Chair reassured that decisions would be taken on a meeting-by-meeting basis. Of course in practice and based on historical experience, the first interest rate increase is normally followed by several others, but the fact that Yellen retained her flexibility was seen as a positive. While Yellen appeared upbeat on growth and the labor market, interest rates were also unlikely to rise before June. According to futures markets estimates, October is apparently the month in which the probability of a rate hike is greater than 50%. Yellen’s reassuring tone caused a rally for both safe haven government bonds and riskier stocks. The 10-year US Treasury bond yield fell below 2% once more and the S&P 500 closed at a new all-time record well above 2,100. The dollar was relatively soggy following the testimony – particularly against the yen – although the divergence between the Fed looking to raise rates and other major central banks looking to loosen policy, was still supportive for the greenback.